Jakarta-Singapore, one of the world’s largest routes, will see a major surge of additional capacity in 2013 as a newly expanded bilateral between Indonesia and Singapore is implemented. Singapore-based low-cost carrier Tiger Airways and its new Indonesian affiliate Mandala Airlines will be the biggest beneficiary as the Tiger Group currently only has a paltry 5% share of capacity in the Jakarta-Singapore market. Tiger and Mandala are each preparing to add several daily flights on the route, supplementing Tiger’s current schedule of only two daily flights. Other LCCs – including Indonesia AirAsia, Lion Air and Jetstar Asia – will also benefit from the new bilateral while full-service carriers are likely to see their market share drop, including market leader Singapore Airlines (SIA). AirAsia and Lion will be keen to add Jakarta-Singapore flights to maintain their leading shares of LCC capacity in the market as Tiger/Mandala attempt to quickly match or surpass their existing thicker schedules. AirAsia and Lion each currently operate six daily flights on the route. The new bilateral provides ample space for growth as it increases total seat capacity between Indonesia and Singapore by 50% on the four main routes between the two countries – Singapore to Jakarta, Bali, Surabaya and Medan. Opening up additional capacity on Jakarta-Singapore represents the biggest breakthrough as the current limit had been reached for some time on both the Indonesia and Singapore sides. Jakarta-Singapore is by far the biggest route between the two countries, accounting for over 50% of total Indonesia-Singapore capacity. Total capacity between Jakarta and Singapore has been flat at slightly over 100,000 return seats over the last two years due to the bilateral restriction. The slight fluctuation in total capacity since 2011 has been driven by carriers that have fifth freedom rights on the route, which do not count against the cap. The four Indonesian and three Singaporean carriers operating the route have all been maintaining the same amount of capacity with the exception of small temporary seasonal adjustments in some cases. A fifth Indonesian carrier, Batavia, also operated the route until it suspended operations in Jan-2013 but was a small player with one daily frequency giving it only a 2% share of the total market. 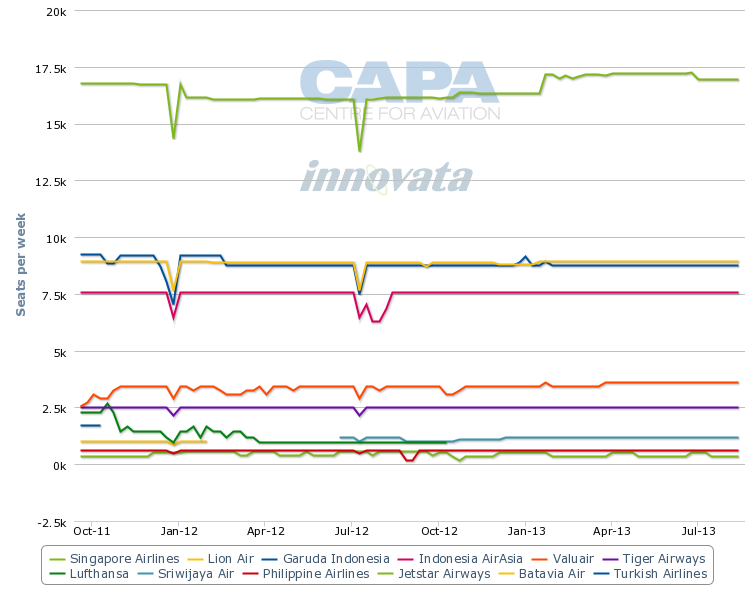 SIA currently has a leading 33% share of seat capacity in the Jakarta-Singapore market. Singapore-Jakarta is SIA’s largest route based on weekly seat capacity and frequencies. SIA has eight daily flights on the route. Garuda Indonesia is tied with SIA as the largest carrier on the route in terms of frequency and is roughly tied with Lion as the second largest carrier in terms of seat capacity. Garuda currently has eight daily flights on the Jakarta-Singapore route and 17% of capacity. The big gap between Garuda and SIA, about 8,000 one-way seats, is driven by the fact that SIA is the only widebody operator on the route with the exception of Turkish Airlines. Garuda now uses 737-800s for all its Jakarta-Singapore flights. With Batavia’s exit, there are only three other full-service carriers remaining on the route: Indonesia’s Sriwijaya Air, with one daily flight and a 2% share of capacity; Turkish Airlines, with one daily flight and a 4% share of capacity; and Philippine Airlines (PAL), with four weekly flights and a 1% share of capacity. The remaining 43% share of capacity is spread across four LCCs, led by Lion with 17% and Indonesia AirAsia with 14%. Both carriers have six daily frequencies but Lion has more capacity as it operates its 213-seat 737-900ERs on the route while AirAsia’s fleet consists only of 180-seat A320s. The Jetstar Group currently has a 7% share of capacity and Tiger has 5%. The Jetstar Group has 21 weekly frequencies between Singapore and Jakarta, with 19 operated by Singapore-based subsidiary Valuair and two frequencies operated by Australia-based Jetstar Airways as part of a Perth-Jakarta-Singapore route. Jetstar Airways, Turkish and PAL are currently the only three carriers from outside Singapore and Indonesia serving the route, although Lufthansa and Qatar Airways are among the several carriers which have previously operated Jakarta-Singapore using fifth freedom rights. Jetstar says it is now considering applying for some of the additional capacity made available to Singapore-based carriers. Jetstar could potentially seek additional capacity under the Valuair air operators’ certificate (AOC), which Jetstar acquired in 2005 along with Valuair’s traffic rights to Jakarta and three other destinations in Indonesia. Jetstar could be tempted to add frequencies to close the gap with larger Lion, AirAsia and soon a larger Tiger/Mandala. AirAsia, Lion, Jetstar and Tiger are among the five biggest LCC groups in Asia and control over 70% of LCC capacity within Southeast Asia (includes domestic and international capacity). With Jakarta-Singapore being the single biggest international route within Southeast Asia, there is potentially enough demand to support several daily frequencies from all four players. But Jetstar is generally not as keen on expanding in Indonesia as its three rivals. Jetstar is the only one among the four groups without a domestic carrier in Indonesia, which poses a disadvantage in competing in the Jakarta-Singapore market as it does not have a strong local brand to leverage for Indonesia point of sales. The Tiger Group is planning to seek traffic rights to support at least eight daily flights, including four for Mandala and at least two additional frequencies for Tiger. The process of distributing the newly available traffic rights has not yet begun on either the Indonesian or Singaporean sides. But Mandala has already been authorised by Indonesian authorities for Jakarta-Singapore, using the traffic rights and slots previously held by Batavia. In exchange, Mandala is required to carry at no charge Jakarta-Singapore passengers who had already paid prior to Batavia’s bankruptcy for future travel on Batavia’s now suspended flight. Mandala tells CAPA that it plans to seek an allocation beyond what Batavia had and initially operate four daily flights starting during the upcoming 2013 northern hemisphere summer season. Tiger is preparing to apply for some of the traffic rights available to Singaporean carriers and is likely to seek an initial increase of two or three flights for a total of four to five. An AirAsia source says the group is also planning to seek an increase but has not yet determined how many additional Jakarta-Singapore frequencies it will apply for. AirAsia will certainly be eager to keep ahead of Tiger/Mandala and also maintain the same number of flights as Lion, which is likely to also take the opportunity to increase its Jakarta-Singapore flights beyond the current six. AirAsia and Lion have emerged as the biggest LCC competitors in Southeast Asia and both will want to make sure the other does not get ahead on the biggest international route within Southeast Asia. But Tiger/Mandala will have an advantage over AirAsia and Lion in that they have the flexibility to secure traffic rights from both sides and are better positioned from a slot perspective as they have local carriers in each country, giving them the option of shifting around slots to accommodate a high frequency Jakarta-Singapore schedule. AirAsia and Lion will likely have trouble securing additional slots at Singapore during peak periods given the current congestion at Changi. The most likely outcome would see AirAsia, Lion and Tiger operating eight to nine daily flights each with Jetstar unlikely to match but potentially adding a modest amount of capacity. Such increases would result in over 30 daily LCC flights in the Jakarta-Singapore market compared to only 17 currently. It is therefore conceivable most of the 50% available additional capacity in the Jakarta-Singapore market could be rapidly swallowed by LCCs. An increase of 13 daily frequencies from LCCs would provide about 17,000 additional weekly one-way seats in the market, accounting for about two-thirds of the additional capacity allowed under the expanded bilateral. LCCs will almost certainly see their share of the Jakarta-Singapore market increase beyond 50%. Some increases by full-service carriers are likely but will be more modest. Sriwijaya, for example, could look to bolster their Singapore schedule beyond the current one daily flight. But Sriwijaya’s positioning in the middle of the market (between budget and full-service) with a predominately local brand would make it difficult for the carrier to compete. Sriwijaya could be better off continuing to focus on domestic expansion. Lion could also seek to have its new full-service subsidiary Batik Air enter the Singapore market. Batik is planning to launch domestic services by the end of 2013 but the opportunity to compete with Garuda and SIA at the top end of the largest premium short-haul international market from Jakarta could be enticing. Garuda could respond by advancing by one year the launch of international services by its budget subsidiary, Citilink, which currently only operates domestically and for now does not intend to expand into the international market until 2014. Garuda could also look to add mainline capacity on Jakarta-Singapore by up-gauging peak hour slots from 737-800s to A330s or even 777-300ERs, which it starts taking later this year. With eight daily flights, up-gauging the more popular frequencies could be a more appealing option than adding frequencies, particularly given the tight slot situation in both Singapore and Jakarta. It is hard to imagine a significant increase in capacity for SIA given it already operates eight widebody flights to Jakarta but an additional modest increase is possible as the carrier would be keen to continue to build on its strong position in Indonesia’s capital. Jakarta is a huge source for premium and economy passengers on SIA’s long-haul network as well as on the group’s flights within Asia. Another option for the SIA Group would be to have its new budget subsidiary Scoot enter the market with one daily flight. Scoot is a long-haul LCC but also now serves one short-haul route, Bangkok, and is considering a second short-haul route to optimise utilisation of its fleet, which will increase to five 777s in mid-2013. With a large portion of the potential 50% capacity increase being added in 2013, the Jakarta-Singapore route will again surge up the global rankings. For the week commencing 25-Feb-2013, Jakarta-Singapore is the world’s second largest international route, marginally ahead of Kuala Lumpur-Singapore but still well behind Hong Kong-Taipei. Overall Jakarta-Singapore currently is the 14th largest route (includes domestic and international). The expected forthcoming capacity increase will likely see it nudge into the total top 10 but not overtake Hong Kong-Taipei as the largest international route. Note: Turkish Airlines’ capacity on Jakarta-Singapore route is not included. Medan’s new airport, Kuala Namu, is listed although it has not yet opened and replaced the existing Polonia airport. But it is debatable if the entire 50% capacity increase is sustainable – assuming carriers fully take advantage of the opportunities in the newly extended bilateral as expected. Competition between Jakarta and Singapore is already fierce with frequent promotional roundtrip fares of about SGD100 (USD80) or less. A significant amount of new capacity, particularly from LCCs, could lead to irrational competition. Wary of the hypercompetition among LCCs within Southeast Asia, Jetstar Asia has adapted a wait and see attitude to expanding in the region although capacity increases in some select markets are still possible. Jetstar is now focusing more on new markets in North Asia, where the LCC penetration rate is significantly lower. LCCs now account for 57% of capacity within Southeast Asia but only 9% within North Asia, according to OAG data. AirAsia, Lion and Tiger are more confident that the Southeast Asia market can continue to absorb large influxes of LCC capacity, with low fares stimulating new demand on routes such as Jakarta-Singapore. But with fares already low and LCCs already accounting for 43% of total capacity on the Jakarta-Singapore route, it could be difficult to grow the market by 50%. Yields will likely decrease and what is now primarily a profitable route could move into the red. However, an increase in capacity on Jakarta-Singapore is long overdue and there is likely some latent demand due to the previous bilateral restrictions. Singapore authorities had been pushing for a new bilateral with Indonesia for the last two years. Indonesian authorities were initially reluctant to increase capacity on the Jakarta-Singapore route, fearing further expansion by Singapore-based carriers, particularly SIA, will lead to Indonesian carriers losing traffic to international destinations that the SIA group serves beyond Singapore. SIA’s large operation in Jakarta is supported by a significant amount of sixth freedom traffic. This has traditionally been a sore point for Indonesian authorities and Garuda, which at one point tried to compete against SIA by operating fifth freedom flights from Jakarta via Singapore to destinations in Asia, including China and Vietnam. Indonesian authorities surprised the Indonesian carriers in forging the recent agreement with Singapore as there was an impression that Indonesia would continue to wait before allowing more capacity to Jakarta from Singaporean carriers and that at most a 25% increase would be allowed. But the reality is LCCs rather than SIA will primarily benefit from the additional available capacity in the Jakarta-Singapore market. While the LCCs also now carry some transit passengers, they mainly cater to the point-to-market and are well positioned to cash in on the expected continued increase in demand for local Jakarta-Singapore travel, driven by Indonesia’s booming economy and the close ties between the two countries. Part Two of this report, to be published later this week, will examine the potential growth on some of the other 13 routes between Indonesia and Singapore for both low-cost and full-service carriers. It will also look at the importance of the Indonesian market to the continued growth of Singapore Changi.